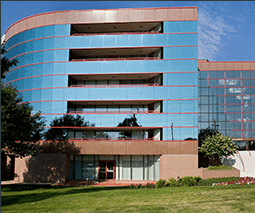 Posted 01-7-2016 filed under CompTIA A+. Motherboards – Connect everything together. Typical form factors include ATX (most common), microATX, ITX, and BTX. AMD and older intel chipsets include a northbridge that connects the CPU, RAM, and x16 PCIe devices, and southbridge that connects secondary systems such as USB, SATA, IDE, and sound. Types of expansion buses include PCI, AGP, PCI Express (PCIe), AMR, CNR, and PC Card (PCMCIA). Newer Intel chipset designs incorporate northbridge functionality into the CPU that connects to a single-chip chipset via DMI or QPI. AMD CPU to chipset connection is HyperTransport. BIOS (Basic Input/Output System) identifies, tests, and initializes components and boots to hard drive. CMOS (complementary metal-oxide semiconductor) stores time/date, passwords. CR2032 lithium battery provides power to CMOS. In BIOS, you can configure: time/date, boot device priority (boot order), passwords, power management, WOL (Wake On LAN), monitoring. To update BIOS, flash it with new firmware. Alternatively referred to as the mb, mainboard, mobo, mobd, backplane board,base board, main circuit board, planar board, system board, or a logic boardon Apple computers. The motherboard is a printed circuit board that is the foundation of a computer, located at the bottom of the computer case. It allocates power to the CPU, RAM, and all other computer hardware components. Most importantly, the motherboard allows hardware components to communicate with one another. 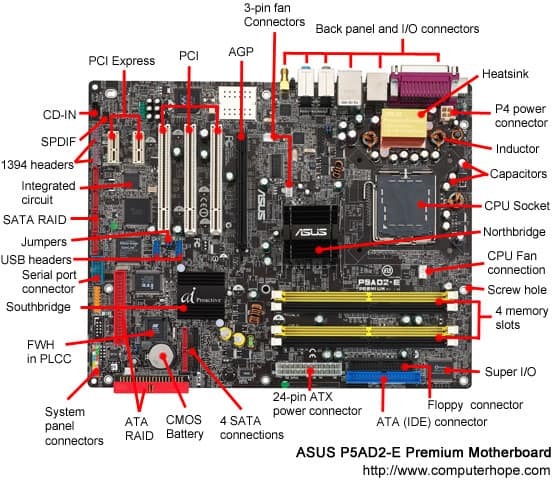 Below is a picture of the ASUS P5AD2-E motherboard with names of each major component of the motherboard. Clicking on the image below gives you a larger more detailed version of the picture below. Below is a listing of other motherboard components that are not shown in the picture above or were part of older computer motherboards. As computers advanced, so have motherboards. Below is a listing of the various motherboard form factors and additional information about each of these form factors including ATX, the most commonly used motherboard form factor today.